After many requests to start supporting des_crypt() hashes (used with older UNIX systems like QNX), we have finally added support! We currently only offer a full keyspace search of all typeable characters 0x20 (space) to 0x7e (~) and 0x0 (null) for all possible 8 character combinations (which also covers all possible shorter passwords). As far as we can tell, this 100% guarantees that we will find the password no matter how complex. This requires 25 rounds of DES but the keyspace is roughly 1/10th the size of the entire DES keyspace so cracking takes a worst case time of around 3.5 days. Because of this, we’ve set the pricing is roughly 3x that of doing a DES KPT job. 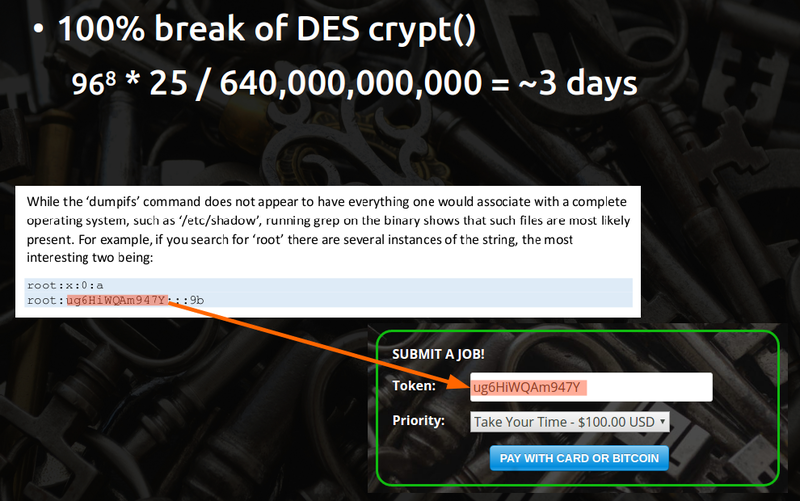 To submit a job, simply type your des_crypt() hash into the submission box on the Get Cracking page and click submit! Crack.sh guarantees that it will 100% produce a working key for jobs submitted. If for some reason a key isn't found, crack.sh will immediately refund your payment, fix any problem in its system that made it not find the key, and deliver the key to you once it's fixed. The service provided does a 100% search of the entire keyspace so it is guaranteed that if (a) key(s) exists, the system will find it. For standard DES cracking jobs (MSCHAPv2 and KPT) the system searches the entire 256 = 72,057,594,037,927,936 possible combinations. For des_crypt() jobs, crack.sh searches for all possible 8 character combinations (max size) of typeable characters from 0x20 (space) to 0x7e (~) and including the 0x0 (null) character to cover all possible lengths of passwords for a total keyspace of 968 = 7,213,895,789,838,336 possible combinations. Any data provided by ToorCon, Inc., to a user of the “crack.sh DES cracking service” is subject to United States export laws including but not limited to the United States Treasury Department’s Office of Foreign Assets Control (OFAC) regulations (31 Code of Federal Regulations Part 500). OFAC prohibits United States persons and companies and their foreign subsidiaries, from engaging in, facilitating, or approving, transactions by or with persons, companies, governments, government entities, government agencies, quasi government entities, or foreign nationals of, or from, countries embargoed by the United States, currently, Cuba, Iran, Syria, North Korea and Northern Sudan. All such activity is prohibited by United States law and such data cannot be transferred in any way to any person, company or entity in such an embargoed country. The user of this site acknowledges an understanding of this paragraph prior to use of the site, will abide by its terms, will not violate United States export law, directives, regulations or sanctions whether stated here or not; and acknowledges that it is not from a country currently embargoed, sanctioned, or prohibited in any way by the United States Government. As a user, you further warrant that you are not listed on any United States Government maintained “denied list” including the Commerce Department's Denied Persons List, the Commerce Department's Entity List, the Directorate of Defense Trade Controls List of Statutorily Debarred Parties, or the Treasury Department's List of Specially Designated Nationals. © Copyright 1999-2016 ToorCon, Inc. crack.sh is a service of the ToorCon Information Security Conference and is provided for research purposes only.